It’s no secret that Mario is a big favourite with children and has been for decades now but children with Autism may see a lot of extra benefits from playing his games, you just have to be careful which ones and for how long. First, let me say that I suggest you stick to the Nintendo Wii. The problem solving skills and hand eye coordination that you get from other consoles is good but the unique nature of the Wii really adds a whole other level of treatment that I will discuss in a bit. The first game that we introduced Cameron to was Mario Kart Wii, in which you drive your cart in a race against the rest of the game characters, but instead of just pressing left and right buttons, you actually hold the controller out in front of you like a steering wheel and have to rotate it left and right to turn… further more, the more you rotate it, the harder you turn. This teaches your child the severity of his actions… how to do something a little bit to get a little bit of reaction. More so than that, it’s a great introduction to video games in general as there isn’t a lot to it beyond pressing one button and steering. And for a first timer, especially at 3 or 4 years old, pressing a button and remembering to turn a controller is about the most multi-tasking that you could expect them to handle. Cameron went from being behind in his motor skills to being right on par with others his age and a lot of it is due to Mario Kart Wii. The next game proved to be more harmful than beneficial and that is the Super Mario Bros Wii game where four players can play all at once, and is modelled very closely after the original game. This game is played like the old console games where you press the left and right buttons, jump button, running button and has the occasional shaking action here and there. The problem with this game is that it has 8 worlds to conquer and even the most expert player would take a while to get through it all. Which means that if you intend on limiting your child to an hour, 2 hours… 24 hours (who does that?? ), it still isn’t enough to win the game and therefore turning it off means an interruption in their game. On the bright side, this lead to us helping him master his emotions, his expectations of him when it came time to be disappointed and so forth. But, even the most level headed and prepared Autistic can still end up in a pretty wild rage filled tantrum when you turn off something they’re right in the middle of. Cameron’s uncle bought him Mario Galaxy 2, which really exercises his motor skills as it immerses him in some world sized problems and really flexes his 3D muscles as he’s running circles around planetoids in the sky. The problem comes, again, with turning it off. This game can take months to finish and so you will find yourself having to turn it off right in the middle of your child’s game and facing another tantrum. Enter Mario Party 8… the latest Mario game that Cameron received for his 5th birthday. Mario Party 8 is essentially a big board game with mini games at the end of each turn. You roll the dice, move your squares, try to get to the star first and then, when everyone did their turn, you play a quick 1 to 2 minute mini game. The number of turns is pre-defined at the beginning of the game, so you can set your child’s game to a quick 10 turns or a very very long 50 turns. It’s up to you and how generous you are feeling. Once those turns are done, the winner is announced and the game is done. This offers the perfect opportunity to pack it up until next time without any harsh interruptions. Instead of being forced in Mario, you get to choose from a rather large list of characters. Your child gets to choose their character, let friends choose theirs and even choose who the computer will be. This teaches your child that not everyone wants the same things that he/she does. It can be very difficult for a young Autistic to understand that other people don’t want what they want… that they could possibly not pick Luigi when they picked Mario… they’re a perfect match, a team! It took Cameron a little while but then he learned and now understands that other children need to make their own choices. Once you’re playing, you’re forced into turn taking. There’s no grabbing at dice to take another turn.. the controls are given to the next player.. it’s set, no questioning it. You wait until your controller makes a noise and it’s your turn again. There are a huge number of mini games and each tests different skills. On top of this, it promotes team work as some games will be 4 on 4, but then some will also be 3 against 1 or 2 against 2. This means that you have to learn to work on your own, to work against everyone or be on a team with another person and work together. Cameron can communicate most easily when he’s talking about something he loves and Mario is definitely one of those things. When he has a friend to play with, it’s easy for him to talk to him because he can show them what to do, teach them new things and get excited about game events as they happen together. The game allows for people of different skill levels to play and everyone will have a chance to win. My wife and I can play with him and no matter how well we do, or he does, anyone could win. This means that your child has a chance at being super proud of beating his parents but it also means that they don’t have to take is so hard if beaten either because everyone gets a chance to win. Not only does the game help in social aspects, it is also great for fine motor skills and even gross motor skills all thanks to the Nintendo Wii technology. With so many mini games, your child will have to punch, roll, turn, balance, point at the screen and more in order to do well. It runs the whole gambit of the controller’s capabilities. Most children like video games and we all know that they do have their benefits in developing problem solving skills and motor skills but for us parents of Autistic children, it can be a whole other world of meltdowns and so we just avoid letting them play all together. 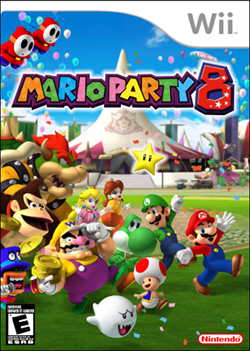 Mario Party 8 is a great solution as it offers more benefits than any other game we’ve tried or heard of thus far. Cameron has really excelled in so many facets of his life and is in large part due to this game. He takes turns with other children so much better now when playing regular board games, he lets his friends decide things for themselves now, he is just doing great. As always, I don’t promise that your child will have the same reactions or benefits as mine since all children are different (especially with Autism) but if you’re tired of the meltdowns that come with turning the game off, Mario Party 8 may be a good game to try. My only tip/suggestion that I must insist on you, play with your child! It’s a fun board/video game so don’t fear it, don’t just dismiss it because you don’t play video games… get involved, take the plunge. Playing with your child is not only beneficial but it’s also just about the best thing you can do as a parent. Be involved. ← How To Get A Child With Autism to Sleep? Good advice – even for “typical” kids. It’s funny but, I actually wish my son played more video games. He is completely uninterested. I think it would be great for his fine motor skills and give him appropriate stuff to talk with other 12 year olds about. Oh well. I first bought a wii for my wife when they first came out. My son wyatt who is autistic picked up on it really quickly. He has a wii u now and face the same problems of its times to get off. He plays lego batman now and every time he unlocks a new character he wants more time. ABA treatment. Does anyone have any experience with this issue? I WORK WITH AN AUTISTIC TEEN AT A HIGH SCHOOL AND I HAVE SEVERAL TEACHERS AND FRIENDS WITH AUTISTIC CHILDREN. PLEASE PUT ME ON YOUR E-MAIL LIST. MY TEEN I WORK WITH LOVES MARIO VIDEO GAMES AND HIS MOM JUST GOT THE WII. Being a decent parent means knowledge of the daughter’s or son’s necessities. Watch your boy or girl and discover the signs of exactly what they may be after. With Super Mario Bros., I ended up beating it, and saving, and now he can play any level he feels like playing. Most of the time we play together, and I help him get to the end, even if it means picking up Luigi and carrying him to the flag on my head. Heh. As far as turning it off, I use the good ol’ transition standard: the timer. A lot of autistic kids have narrow, intensely focused interests – our son obsesses over video games. He LOVES Mario Kart, so maybe we’ll try this one as well! You might enjoy Will Playground. It’s another mini game that encourages social skills. What’s up with the d**n tweet/dig bar. I cannot read the article because of the thing. dboz555, what browser/OS are you using? Are you viewing it in a mobile browser? Just IE 7 on an XP machine. The bar hovers over your first few paragraphs and the just stays in the middle of the page. So I can read the stuff under it, but not the first few paragraphs. I am sorry for being aggressive about it, but I get tired of these things all over articles. I have extreme adult ADD and being able to highlight the words as I read them really helps, but nowadays everyone has these pop-ups that come up as you hover your mouse over a word. This makes it hard to highlight as you read. When I got to your article the bar was just there and will not go away which is even worse. People do not make websites thinking about their ADD readers. I do enjoy the manner in which you have framed this specific issue and it does indeed give me some fodder for thought. Nevertheless, through just what I have observed, I basically hope when other feedback pile on that men and women keep on issue and not start upon a tirade of the news du jour. Anyway, thank you for this superb piece and while I can not really go along with this in totality, I regard your perspective. Do you have any advice on getting the child used to playing? My son is 3 and has mild autism. He has very little interests other than watching disney movies over and over and I want to get him to do something a little more stimulating. . I have tried to get him to play other games but he shows very little interest. He doesn’t seem to like holding the controller… He loves watching the bowling game on wii sports but every time I’ve tried to get him to play he refuses. Video games helped me with my attention span as a child with adhd and I am hoping it will help him as well. I plan on trying Mario Kart with him in a few days when I get it back from a friend. Unfortunately, you can’t really force an interest on someone. My younger son has no real interest in video games either. He would much rather prefer to be painting or other crafts. Still though, there are some easier games, such as Mario Kart, as you mentioned and some Xbox Kinect games that are pretty easy. Those require no controller at all and may be better suited. If not though, it may just be that he is either not ready or never will be. It’s rare, I must admit, but some children just simply do not care about video games. Thanks for this post! For a lot of kids (both autistic and non-autistic) I think that Nintendo video games are a great way to teach them things and play together since they’re naturally engaging and also kid-friendly. As long as you make sure their attraction to the game doesn’t turn to addiction it’s a great option. brilliant article, just the info i was looking for. practical advice on how to manage them! Great advice, our ABA therapist recommended that my son have similar interests to his peers. However this article explains even more benefits. We also use the Wii “Just Dance” in my family to improve my son’s coordination and focus. It’s great to see progress in just a few weeks. Thank you for your articles. My 10 year old grandson finishes a whole game in one day. Very expensive indeed! His dad and dad’s friends would ask HIM to help them with levels they could not beat. My daughter with Traumatic Brain Injury learned to sequence at the age of 16, when my other daughter bought her a Gameboy. Her eye hand coordination also developed very quickly. I am all about helping autistic children with video games. I also know that music helps to calm autistic children who are in distress, but so far, I have not been able to find useful information.